Odysseus (/oʊˈdɪsiəs, oʊˈdɪsjuːs/; Greek: Ὀδυσσεύς [odysˈsews]), also known by the Latin name Ulysses (US /juːˈlɪsiːz/, UK /ˈjuːlɪsiːz/; Latin: Ulyssēs, Ulixēs), was a legendary Greek king of Ithaca and the hero of Homer's epic poem the Odyssey. Odysseus also plays a key role in Homer's Iliad and other works in that same epic cycle. Husband of Penelope, father of Telemachus, and son of Laërtes and Anticlea, Odysseus is renowned for his brilliance, guile, and versatility (polytropos), and is hence known by the epithet Odysseus the Cunning (mētis, or "cunning intelligence"). He is most famous for the Odyssey, ten eventful years he took to return home after the decade-long Trojan War. The name has several variants: in Greek the character was called Olysseus (Ὀλυσσεύς), Oulixeus (Οὐλιξεύς), Oulixes (Οὐλίξης), and he was known as Ulyssēs in Latin or Ulixēs in Roman mythology. Hence, "there may originally have been two separate figures, one called something like Odysseus, the other something like Ulixes, who were combined into one complex personality." The etymology of the name is unknown. Ancient authors linked the name to the Greek verbs odussomai (Greek: ὀδύσσομαι) 'to be wroth against, to hate', or to oduromai (ὀδύρομαι) 'to lament, bewail'. Homer in references and puns, relates it to various forms of this verb. It has also been suggested that the name is of non-Greek origin, probably not even Indo-European, with an unknown etymology; R. S. P. Beekes has suggested a Pre-Greek origin. In Book 19 of the Odyssey, where Odysseus's early childhood is recounted, Euryclea asks Autolycus to name him. Euryclea tries to guide him to naming the boy Polyaretos, "for he has much been prayed for" (19.403f). Autolycus "apparently in a sardonic mood ... decided to give the child a name that would commemorate his own experience in life. 'Because I got odium upon myself before coming here ... from many ... let the child's name be Odysseus to signify this.' The pun was prophetic as well as commemorative." Odysseus often receives the patronymic epithet Laertiades (Λαερτιάδης), "son of Laërtes". In the Iliad and Odyssey there are several epithets used to describe Odysseus. His name and stories were adopted into Etruscan religion under the name Uthuze. 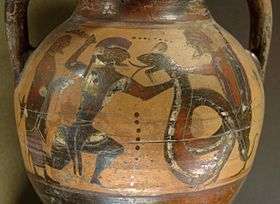 Relatively little is known of Odysseus's background other than that his paternal grandfather (or step-grandfather) is Arcesius, son of Cephalus and grandson of Aeolus, whilst his maternal grandfather is the thief Autolycus, son of Hermes and Chione. Hence, Odysseus was the great-grandson of the Olympian god Hermes. According to the Iliad and Odyssey, his father is Laertes and his mother Anticlea, although there was a non-Homeric tradition that Sisyphus was his true father. The rumor went that Laertes bought Odysseus from the conniving king. Odysseus is said to have a younger sister, Ctimene, who went to Same to be married and is mentioned by the swineherd Eumaeus, whom she grew up alongside, in Book 15 of the Odyssey. Homer's Iliad and Odyssey portray Odysseus as a culture hero, but the Romans, who believed themselves the heirs of Prince Aeneas of Troy, considered him a villainous falsifier. In Virgil's Aeneid, written between 29 and 19 BC, he is constantly referred to as "cruel Odysseus" (Latin "dirus Ulixes") or "deceitful Odysseus" ("pellacis", "fandi fictor"). Turnus, in Aeneid ix, reproaches the Trojan Ascanius with images of rugged, forthright Latin virtues, declaring (in John Dryden's translation), "You shall not find the sons of Atreus here, nor need the frauds of sly Ulysses fear." While the Greeks admired his cunning and deceit, these qualities did not recommend themselves to the Romans, who possessed a rigid sense of honour. In Euripides's tragedy Iphigenia at Aulis, having convinced Agamemnon to consent to the sacrifice of his daughter, Iphigenia, to appease the goddess Artemis, Odysseus facilitates the immolation by telling her mother, Clytemnestra, that the girl is to be wed to Achilles. His attempts to avoid his sacred oath to defend Menelaus and Helen offended Roman notions of duty; the many stratagems and tricks that he employed to get his way offended Roman notions of honour. When Helen is abducted, Menelaus calls upon the other suitors to honour their oaths and help him to retrieve her, an attempt that leads to the Trojan War. Odysseus tries to avoid it by feigning lunacy, as an oracle had prophesied a long-delayed return home for him if he went. He hooks a donkey and an ox to his plow (as they have different stride lengths, hindering the efficiency of the plow) and (some modern sources add) starts sowing his fields with salt. Palamedes, at the behest of Menelaus's brother Agamemnon, seeks to disprove Odysseus's madness and places Telemachus, Odysseus's infant son, in front of the plow. Odysseus veers the plow away from his son, thus exposing his stratagem. Odysseus holds a grudge against Palamedes during the war for dragging him away from his home. Odysseus and other envoys of Agamemnon travel to Scyros to recruit Achilles because of a prophecy that Troy could not be taken without him. By most accounts, Thetis, Achilles's mother, disguises the youth as a woman to hide him from the recruiters because an oracle had predicted that Achilles would either live a long uneventful life or achieve everlasting glory while dying young. Odysseus cleverly discovers which among the women before him is Achilles when the youth is the only one of them to show interest in examining the weapons hidden among an array of adornment gifts for the daughters of their host. Odysseus arranges further for the sounding of a battle horn, which prompts Achilles to clutch a weapon and show his trained disposition. With his disguise foiled, he is exposed and joins Agamemnon's call to arms among the Hellenes. Odysseus is one of the most influential Greek champions during the Trojan War. Along with Nestor and Idomeneus he is one of the most trusted counsellors and advisors. He always champions the Achaean cause, especially when the king is in question, as in one instance when Thersites speaks against him. When Agamemnon, to test the morale of the Achaeans, announces his intentions to depart Troy, Odysseus restores order to the Greek camp. Later on, after many of the heroes leave the battlefield due to injuries (including Odysseus and Agamemnon), Odysseus once again persuades Agamemnon not to withdraw. Along with two other envoys, he is chosen in the failed embassy to try to persuade Achilles to return to combat. When Hector proposes a single combat duel, Odysseus is one of the Danaans who reluctantly volunteered to battle him. Telamonian Ajax, however, is the volunteer who eventually fights Hector. Odysseus aids Diomedes during the night operations to kill Rhesus, because it had been foretold that if his horses drank from the Scamander River, Troy could not be taken. After Patroclus is slain, it is Odysseus who counsels Achilles to let the Achaean men eat and rest rather than follow his rage-driven desire to go back on the offensive—and kill Trojans—immediately. Eventually (and reluctantly), he consents. During the funeral games for Patroclus, Odysseus becomes involved in a wrestling match and foot race with Telamonian Ajax. With the help of the goddess Athena, who favored him, and despite Apollo's helping another of the competitors, he wins the race and draws the wrestling match, to the surprise of all. Odysseus has traditionally been viewed in the Iliad as Achilles's antithesis: while Achilles's anger is all-consuming and of a self-destructive nature, Odysseus is frequently viewed as a man of the mean, renowned for his self-restraint and diplomatic skills. He is more conventionally viewed as the antithesis of Telamonian Ajax (Shakespeare's "beef-witted" Ajax) because the latter has only brawn to recommend him, while Odysseus is not only ingenious (as evidenced by his idea for the Trojan Horse), but an eloquent speaker, a skill perhaps best demonstrated in the embassy to Achilles in book 9 of the Iliad. The two are not only foils in the abstract but often opposed in practice since they have many duels and run-ins. When Achilles is slain in battle by Paris, it is Odysseus and Telamonian Ajax who retrieve the fallen warrior's body and armour in the thick of heavy fighting. During the funeral games for Achilles, Odysseus competes once again with Telamonian Ajax. Thetis says that the arms of Achilles will go to the bravest of the Greeks, but only these two warriors dare lay claim to that title. The two Argives became embroiled in a heavy dispute about one another's merits to receive the reward. The Greeks dither out of fear in deciding a winner, because they did not want to insult one and have him abandon the war effort. Nestor suggests that they allow the captive Trojans decide the winner. Some accounts disagree, suggesting that the Greeks themselves hold a secret vote. In any case, Odysseus is the winner. Enraged and humiliated, Ajax is driven mad by Athena. When he returns to his senses, in shame at how he has slaughtered livestock in his madness, Ajax kills himself by the sword that Hector had given him after their duel. Together with Diomedes, Odysseus fetches Achilles' son, Pyrrhus, to come to the aid of the Achaeans, because an oracle had stated that Troy could not be taken without him. A great warrior, Pyrrhus is also called Neoptolemus (Greek for "new warrior"). 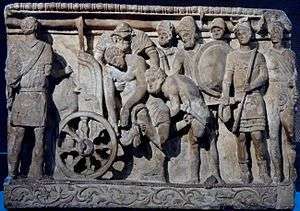 Upon the success of the mission, Odysseus gives Achilles' armor to him. It is learned that the war can not be won without the poisonous arrows of Heracles, which are owned by the abandoned Philoctetes. Odysseus and Diomedes (or, according to some accounts, Odysseus and Neoptolemus) leave to retrieve them. Upon their arrival, Philoctetes (still suffering from the wound) is seen still to be enraged at the Danaans, especially Odysseus, for abandoning him. 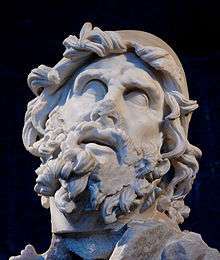 Although his first instinct is to shoot Odysseus, his anger is eventually diffused by Odysseus's persuasive powers and the influence of the gods. Odysseus returns to the Argive camp with Philoctetes and his arrows. Odysseus and Diomedes steal the Palladium that lay within Troy's walls, for the Greeks were told they could not sack the city without it. Some late Roman sources indicate that Odysseus schemed to kill his partner on the way back, but Diomedes thwarts this attempt. Perhaps Odysseus' most famous contribution to the Greek war effort is devising the strategem of the Trojan Horse, which allows the Greek army to sneak into Troy under cover of darkness. It is built by Epeius and filled with Greek warriors, led by Odysseus. On the way home from Troy, after a raid on Ismaros in the land of the Cicones, he and his twelve ships are driven off course by storms. They visit the lethargic Lotus-Eaters and are captured by the Cyclops Polyphemus while visiting his island. After Polyphemus eats several of his men, Polyphemus and Odysseus have a discussion, and Odysseus told Polyphemus his name is "Nobody". Odysseus takes a barrel of wine, and the Cyclops drinks it, falling asleep. Odysseus and his men take a wooden stake, ignite it with the remaining wine, and blind him. While they escape, Polyphemus cries in pain, and the other Cyclopes ask him what the matter is. Polyphemus cries, "Nobody has blinded me!" and the other Cyclopes think he has gone mad. Odysseus and his crew escape, but Odysseus rashly reveals his real name, and Polyphemus prays to Poseidon, his father, to take revenge. They stay with Aeolus, the master of the winds, who gives Odysseus a leather bag containing all the winds, except the west wind, a gift that should have ensured a safe return home. However, the sailors foolishly open the bag while Odysseus sleeps, thinking that it contains gold. All of the winds fly out, and the resulting storm drives the ships back the way they had come, just as Ithaca comes into sight. Guided by Circe's instructions, Odysseus and his crew cross the ocean and reach a harbor at the western edge of the world, where Odysseus sacrifices to the dead and summons the spirit of the old prophet Tiresias to advise him. Next Odysseus meets the spirit of his own mother, who had died of grief during his long absence. From her, he learns for the first time news of his own household, threatened by the greed of Penelope's suitors. Odysseus also talks to his fallen war comrades and the mortal shade of Heracles. Returning to Circe's island, she advises them on the remaining stages of the journey. They skirt the land of the Sirens, pass between the six-headed monster Scylla and the whirlpool Charybdis, where they row directly between the two. 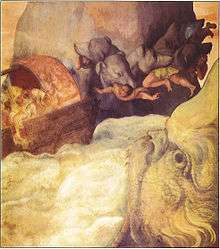 However, Scylla drags the boat towards her by grabbing the oars and eats six men. Odysseus is shipwrecked and befriended by the Phaeacians. After telling them his story, the Phaeacians, led by King Alcinous, agree to help Odysseus get home. They deliver him at night, while he is fast asleep, to a hidden harbor on Ithaca. He finds his way to the hut of one of his own former slaves, the swineherd Eumaeus, and also meets up with Telemachus returning from Sparta. Athena disguises Odysseus as a wandering beggar to learn how things stand in his household. When the disguised Odysseus returns after 20 years, he is recognized only by his faithful dog, Argos. Penelope announces in her long interview with the disguised hero that whoever can string Odysseus's rigid bow and shoot an arrow through twelve axe shafts may have her hand. According to Bernard Knox, "For the plot of the Odyssey, of course, her decision is the turning point, the move that makes possible the long-predicted triumph of the returning hero". Odysseus' identity is discovered by the housekeeper, Eurycleia, as she is washing his feet and discovers an old scar Odysseus received during a boar hunt. Odysseus swears her to secrecy, threatening to kill her if she tells anyone. When the contest of the bow begins, none of the suitors is able to string the bow of Apollo but then, after all the suitors have given up, the disguised Odysseus comes along, bends the bow, shoots the arrow, and wins the contest. Having done so, he proceeds to slaughter the suitors (beginning with Antinous whom he finds drinking from Odysseus' cup) with help from Telemachus and two of Odysseus' servants, Eumaeus the swineherd and Philoetius the cowherd. Odysseus tells the serving women who slept with the suitors to clean up the mess of corpses and then has those women hanged in terror. He tells Telemachus that he will replenish his stocks by raiding nearby islands. Odysseus has now revealed himself in all his glory (with a little makeover by Athena); yet Penelope cannot believe that her husband has really returned—she fears that it is perhaps some god in disguise, as in the story of Alcmene—and tests him by ordering her servant Euryclea to move the bed in their wedding-chamber. Odysseus protests that this cannot be done since he made the bed himself and knows that one of its legs is a living olive tree. Penelope finally accepts that he truly is her husband, a moment that highlights their homophrosýnē (like-mindedness). The next day Odysseus and Telemachus visit the country farm of his old father Laertes. The citizens of Ithaca follow Odysseus on the road, planning to avenge the killing of the Suitors, their sons. The goddess Athena intervenes and persuades both sides to make peace. 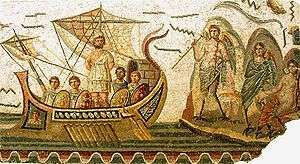 The supposed last poem in the Epic Cycle is called the Telegony and is thought to tell the story of Odysseus's last voyage, and of his death at the hands of Telegonus, his son with Circe. The poem, like the others of the cycle, is "lost" in that no authentic version has been discovered. In 5th century BC Athens, tales of the Trojan War were popular subjects for tragedies. Odysseus figures centrally or indirectly in a number of the extant plays by Aeschylus, Sophocles, (Ajax, Philoctetes) and Euripides, (Hecuba, Rhesus, Cyclops) and figured in still more that have not survived. In the Ajax, Sophocles portrays Odysseus as a modernistic voice of reasoning compared to the title character's rigid antiquity. Plato in his dialog Hippias Minor examines a literary question about whom Homer intended to portray as the better man, Achilles or Odysseus. As Ulysses, he is mentioned regularly in Virgil's Aeneid written between 29 and 19 BC, and the poem's hero, Aeneas, rescues one of Ulysses's crew members who was left behind on the island of the Cyclops. He in turn offers a first-person account of some of the same events Homer relates, in which Ulysses appears directly. Virgil's Ulysses typifies his view of the Greeks: he is cunning but impious, and ultimately malicious and hedonistic. Ovid retells parts of Ulysses's journeys, focusing on his romantic involvements with Circe and Calypso, and recasts him as, in Harold Bloom's phrase, "one of the great wandering womanizers." Ovid also gives a detailed account of the contest between Ulysses and Ajax for the armor of Achilles. 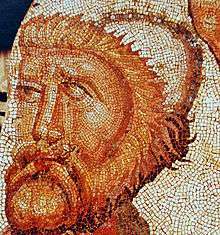 Greek legend tells of Ulysses as the founder of Lisbon, Portugal, calling it Ulisipo or Ulisseya, during his twenty-year errand on the Mediterranean and Atlantic seas. Olisipo was Lisbon's name in the Roman Empire. Basing in this folk etymology, the belief that Ulysses is recounted by Strabo based on Asclepiades of Myrleia's words, by Pomponius Mela, by Gaius Julius Solinus (3rd century AD), and finally by Camões in his epic poem Os Lusíadas. Dante, in Canto 26 of the Inferno of his Divine Comedy, encounters Odysseus ("Ulisse" in the original Italian) near the very bottom of Hell: with Diomedes, he walks wrapped in flame in the eighth ring (Counselors of Fraud) of the Eighth Circle (Sins of Malice), as punishment for his schemes and conspiracies that won the Trojan War. 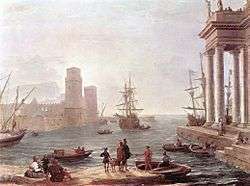 In a famous passage, Dante has Odysseus relate a different version of his voyage and death from the one told by Homer. He tells how he set out with his men from Circe's island for a journey of exploration to sail beyond the Pillars of Hercules and into the Western sea to find what adventures awaited them. Men, says Ulisse, are not made to live like brutes, but to follow virtue and knowledge. He appears in Shakespeare's Troilus and Cressida, set during the Trojan War. Alfred, Lord Tennyson's poem "Ulysses" presents an aging king who has seen too much of the world to be happy sitting on a throne idling his days away. Leaving the task of civilizing his people to his son, he gathers together a band of old comrades "to sail beyond the sunset". Nikos Kazantzakis' The Odyssey: A Modern Sequel, a 33,333 line epic poem, begins with Odysseus cleansing his body of the blood of Penelope's suitors. Odysseus soon leaves Ithaca in search of new adventures. Before his death he abducts Helen, incites revolutions in Crete and Egypt, communes with God, and meets representatives of such famous historical and literary figures as Vladimir Lenin, Don Quixote and Jesus. Irish poet Eilean Ni Chuilleanain wrote "The Second Voyage", a poem in which she makes use of the story of Odysseus. James Joyce's novel Ulysses uses modern literary devices to narrate a single day in the life of a Dublin businessman named Leopold Bloom. Bloom's day turns out to bear many elaborate parallels to Odysseus' twenty years of wandering. In Virginia Woolf's response novel Mrs Dalloway the comparable character is Clarisse Dalloway, who also appears in The Voyage Out and several short stories. Odysseus is the hero of The Luck of Troy by Roger Lancelyn Green, whose title refers to the theft of the Palladium. Frederick Rolfe's The Weird of the Wanderer has the hero Nicholas Crabbe (based on the author) travelling back in time, discovering that he is the reincarnation of Odysseus, marrying Helen, being deified and ending up as one of the three Magi. In S. M. Stirling's Island in the Sea of Time trilogy, Odikweos (Mycenean spelling) is a 'historical' figure who is every bit as cunning as his legendary self and is one of the few Bronze Age inhabitants who discerns the time-travellers' real background. Odikweos first aids William Walker's rise to power in Achaea and later helps bring Walker down after seeing his homeland turn into a police state. Odysseus is also a character in David Gemmell's Troy trilogy, in which he is a good friend and mentor of Helikaon. He is known as the ugly king of Ithaka. His marriage with Penelope was arranged, but they grew to love each other. He is also a famous storyteller, known to exaggerate his stories and heralded as the greatest storyteller of his age. This is used as a plot device to explain the origins of such myths as those of Circe and the Gorgons. In the series, he is fairly old and an unwilling ally of Agamemnon. 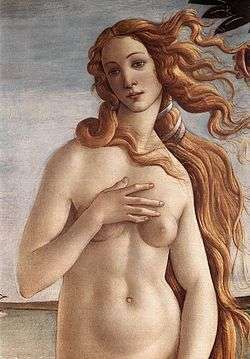 The Penelopiad by Margaret Atwood retells his story from the point of view of his wife Penelope. Return to Ithaca by Eyvind Johnson is a more realistic retelling of the events that adds a deeper psychological study of the characters of Odysseus, Penelope, and Telemachus. Thematically, it uses Odysseus's backstory and struggle as a metaphor for dealing with the aftermath of war (the novel being written immediately after the Second World War). The actors who have portrayed Odysseus in feature films include Kirk Douglas in the Italian Ulysses (1955), John Drew Barrymore in The Trojan Horse (1961), Piero Lulli in The Fury of Achilles (1962), and Sean Bean in Troy (2004). In TV miniseries he has been played by Bekim Fehmiu, L'Odissea (1968), and by Armand Assante, The Odyssey (1997). The literary theorist Núria Perpinyà conceived twenty different interpretations of Odyssey in The Crypts of Criticism: Twenty Readings of The Odyssey (2008). The British group Cream recorded the song "Tales of Brave Ulysses" in 1967. Suzanne Vega's song "Calypso" shows Odysseus from Calypso's point of view, and tells the tale of him coming to the island and his leaving. ↑ Entry: "Ὀδυσσεύς" at Henry George Liddell, Robert Scott, 1940, A Greek-English Lexicon. ↑ Stanford, William Bedell (1968). The Ulysses theme. p. 8. ↑ Helmut van Thiel, ed. (2009). Homers Odysseen. Berlin: Lit. p. 194. ↑ Dihle, Albrecht (1994). Griechische Literaturgeschichte. Psychology Press. p. 19. ISBN 978-0-415-08620-2. Retrieved 27 September 2010. ↑ R. S. P. Beekes, Etymological Dictionary of Greek, Brill, 2009, p. 1048. ↑ Stanford, William Bedell (1968). The Ulysses theme. p. 11. ↑ Burns K.G., Marcy. Literary Anthroponymy: Decoding the Characters in Homer's Odyssey (PDF). Antrocom. pp. 145–159. Retrieved 27 August 2008. ↑ "Mommsen". Ancienthistory.about.com. 15 June 2010. Retrieved 25 September 2011. ↑ Homer does not list Laertes as one of the Argonauts. ↑ Scholium on Sophocles' Aiax 190, noted in Karl Kerenyi, The Heroes of the Greeks, 1959:77. ↑ Spread by the powerful kings, // And by the child of the infamous Sisyphid line [κλέπτουσι μύθους οἱ μεγάλοι βασιλῆς // ἢ τᾶς ἀσώτου Σισυφιδᾶν γενεᾶς]: Chorus in Ajax 189–190; transl. by R. C. Trevelyan. ↑ "A so-called 'Homeric' drinking-cup shows pretty undisguisedly Sisyphos in the bed-chamber of his host's daughter, the arch-rogue sitting on the bed and the girl with her spindle." The Heroes of the Greeks 1959:77. ↑ Sold by his father Sisyphus [οὐδ᾽ οὑμπολητὸς Σισύφου Λαερτίῳ]: Philoctetes in Philoctetes 417; transl. by Thomas Francklin. ↑ "Women in Homer's Odyssey". Records.viu.ca. 16 September 1997. Retrieved 25 September 2011. ↑ Hyginus Fabulae 95. Cf. Apollodorus, Epitome 3.7. ↑ "Hyginus 96". Theoi.com. Retrieved 25 September 2011. ↑ Apollodorus, Epitome 3.8; Hyginus 105. ↑ Sophocles' Ajax 662, 865. ↑ See, e.g., Homer, Odyssey 8.493; Apollodorus, Epitome 5.14–15. ↑ Bernard Knox. (1996). Introduction to Robert Fagles's translation of The Odyssey. p. 55. ↑ Núria Perpinyà. 2008. The Crypts of Criticism: Twenty Readings of The Odyssey (Las criptas de la crítica: veinte lecturas de la Odisea, Madrid, Gredos). ↑ Fokkens, Harry; et al. (2008). "Bracers or bracelets? About the functionality and meaning of Bell Beaker wrist-guards". Proceedings of the Prehistoric Society. University of Leiden. 74. p. 122. Tole, Vasil S. (2005). Odyssey and Sirens: A Temptation towards the Mystery of the Iso-polyphonic Regions of Epirus, A Homeric theme with variations. Tirana, Albania. ISBN 99943-31-63-9. Chisholm, Hugh, ed. (1911). "Odysseus". Encyclopædia Britannica (11th ed.). Cambridge University Press.